Viewing topic "Problem With Sampling a Full Composition Played On C7 Using Slice+Seq Recording Type"
Here is what I have not been able to do on the XS8 and would like to know if it is possible on the XF8 (maybe there is a way and I can’t figure it out- by the way I know how to sample). I would like to live play a full composition on my Yamaha C7 and sample it (entering sample from song mode and mike the piano into the A/D ports) using the slice+seq recording type and assign that sample to a track in a song. So far, so good. The reason is that with slice+seq I can start playback of this sample/track at any point in the song (like a playback head), not just form a note on in the track at the beginning of the song as with the “sample” recording type. Thus I can then listen to what I have recorded/sampled starting from any point in the song and while listening to the already recorded track record another XF voice into another song track and so on. For instance, I could record my live C7 playing and then layer in string voices, drums, etc. on other tracks while listening to the already recorded track (C7 audio) so that I play the new chords and notes in sync and in time with what has already been recorded/sampled. In the straight “sample” type recording, I would have to always start playback at the beginning of the song each take and endlessly wait for the play back to catch up with where I am before continuing with more recorded notes/tracks. The problem is that in the XS8 there is a max of 8 measures available for sample playback with the slice+seq recording type so I can’t sample/record more than 8 measures from the C7 is slice+seq. I need probably 40 measures. Does the XF have more than 8 measures available for sample playback in slice+seq and if so how many? Also, if anyone can suggest another way to handle this situation I would appreciate the guidance. Thanks in advance. First, SLICE+SEQ is specifically designed for use with audio loops - thus the 8 measure limit. You are attempting to use it for something that it is not designed. This does not mean you cannot accomplish what you wish, you just really need to use a different weapon in the Integrated Sampling Sequencer. In order to record audio to the sequencer (properly) in your situation you want to use the RECORDING TYPE = SAMPLE+NOTE or SAMPLE (for several really good reasons). 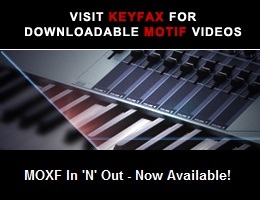 As we are sure you know already, there is no “playback head” in the Motif XS, it is a sampler. The difference between a sampler and a hard disk recorder is significant, it must be triggered by a note-on event. Therefore if your requirement is to be able to start the playback from a specific measure you will need to divide the sample and place a note-on event at that particular point in the timeline. If you use the Motif XS’s clock/metronome as a reference it is a simple matter to subdivide the resulting wave to accommodate your need. When the TEMPO is known, and the sample rate is known, it is simple math to figure out exactly where (down to the sample) every measure begins and ends. If the math is too much, the Motif XS (and the Motif XF) provide you with a convenient tool to calculate exactly where each measure line needs to be drawn. The XS/XF can do the calculations on audio segments up to 32 measures in length beyond that you will need a calculator or a pencil and paper. On the [INTEGRATED SAMPLING] > [EDIT] > [F1] TRIM screen you can see that the START POINT/END POINT are linked to the TEMPO/METER and MEASURE function. You can use these together to work out length in samples of any musical sub-division. Most likely is not going to be necessary to sub-divide the sample into individual beats or even into individual measures (although you can). Most likely you probably can set the sub-division to every 4 measures or every 8 measures but this is entirely up to you. Since you are using SAMPLE+NOTE the actual START POINT is going to be 00004410. The END POINT will be were you set the Motif XS to Punch Out. Make note of how many measures you record - it is a part of your calculation. Press [ENTER] to Extract the completed sample from Start Point to End Point. START POINT will be changed to 00000000 and the END POINT will be changed to accommodate the complete sample start to end. Set the MEASURE parameter = 000:01 (000 Measures 1 beats) - as you Change and increase the number of beats you will see the END POINT change telling exactly how many samples it takes to make the subdivisions you will need. By doing so, you have ‘cued’ the sampler to trim the sample for measures. Press [AUDITION] and verify that it is exactly 4 measures. If it is slightly off due to your playing don’t worry - when you reassmble the data you will not hear the cut - the reassmebly will be sample accurate! You can cut in the middle of note and never hear it! Move the Cursor to the Measure parameter and Change it by moving up a click and back or select a new length as you may require. You now know the length (in samples) of four measures you can easily use the TEMPO/METER/MEASURE calculator to set the START and END POINTS for you or you can simply set them manually. If you decide to do each measure you will have 32 KEYS one per measure. The first time you do this it may go slow. But once you see how accurate this is you can easily divide sample audio clips into any desired length - starting in the middle ceases to be a challenge or an issue. Cueing up the Start/End Points and COPYing KEYBANKS is easy. I’ve never found the need to divide it by every measure (other than to demonstrate how it is done) - when working out a song typically you can divide it at the top of each musical SECTION which are usually 8 or 16 measures - your mileage will vary. Once you have the sample divided you can then trigger the playback by INSERTING NOTE events into the track. Thank you very much Mr. B for taking the time to write your comprehensive instructions. I never would have figured this out on my own. I have some homework ahead of me, but I am glad there is a solution as I would prefer to handle all song creation on the XS (will soon upgrade to XF) without the use of a computer. My gratuitous 2 cents on the issue of creating music on the XS vs. computer is that, speaking for myself as a non-professional with a strong musical background and experience, I can be much more creative and have more fun with the limited time I have available to play music and create songs by just sitting down and using the great features in the XS without having to first turn on the computer, wait for it to warm up, load the software, figure out what tracks I need, reference the tracks to midi/mlan channels, arm the tracks, hope that I do not inadvertently have any audio looping, setting up the XS tracks as external instruments in the software, etc. Anyway, I am one of the “silent” readers who religiously read this forum and always appreciate your instructions on learning how to use these great keyboards. Here is another alternative way to work. We just wanted to present some options. Start with a “scratch” piano track using the internal Motif piano. This allows you to record as MIDI for editing, etc. Add the other instruments like drums, and guitars. Then after the song is finished, muet the ‘scratch piano track” and use the Direct to USB recording feature to record your C7 acoustic piano while playing back and listening to the sequenced backing tracks. We thought this approach might be quicker and more organic than trying to slice audio. It let’s you use MIDI, tempo control ,etc where it appropriate and then add your acoustic piano at the final stage of production. Just another thought on how to work. Thank you Yamaha U.S. for your alternative suggestion. It is much simpler than Mr. B’s suggestion and that will probably be the route I choose, using headphones at low volume for the recorded playback. However, since I would like to really learn this keyboard and Mr. B took the serious and much appreciated time to set out specific instructions on using the sampler, I will also try his method when I can set aside about 6 hours (I’m optimistic)- or maybe I will just compose a shorter song, say 10 measures. Not that technology should drive creativity, but I can’t give up my day job. Thanks again to both of you.